Describe your business in three words. What comes to your mind first? Is it large, forward-looking and lucrative? Great, but there are no limits to perfection. Sooner or later, a well-structured project grows up to the enterprise level. It’s all well and good having a beautiful online shop, but how do you know it’s time for migration? Perhaps when the other website builder can offer more. And that's where we run into Shopify Plus vs Magento 2 Commerce showdown. 'The best way to predict the future is to create it'. What is Shopify Plus? Many Shopify Plus clients are coming to the platform just to accommodate the massive loads associated with flash sales. These flash sales often see thousands of concurrent checkouts. Migrating to Shopify Plus means never having to worry about infrastructure, hosting, networking, or load testing again. Magento 2 Commerce (formerly known as Magento Enterprise Edition) is a premium edition of Magento, a cloud-based platform that was purchased by Adobe in 2018. What’s the difference? Compare Shopify Plus vs Magento 2 Commerce and choose your leader! Choosing the reputable platform for the enterprise-level business can cost you more than you could ever imagine. Every successful financial plan starts with a sound budget. Your first order on eCommerce market is finding out exactly how much you’re spending each month. Running the enterprise-level business, don’t work under the delusion “the more you spend, the more you get”. Your investment needs to be well-considered and paid-off to get you where you want to go. Most retailers focus on pricing page when choosing the most beneficial shopping platform. Extend beyond this step to put a solid budget plan into action. Since the plan costs far from the only spending that lies ahead. We’ll guide you through what’s to be born in mind when calculating expenses and determining payoff goals. Being a newbie is always a tough challenge: if you’ve just replatformed your eStore, you’d face a lot of troubles in terms of month-to-month bug fixing, deployment, and updates, regardless multi-years of eCommerce experience. That’s where customer support becomes a major point for consideration. Shopify Plus clients can get tech help via multiple channels, including online trustworthy forums, a help center, 24/7 phone support, live chat, and email. They also get access to the largest community of specialists including an expert team of Launch Engineers, Solution Engineers, front-end designers, and dedicated support staff. Each retailer assigned a Merchant Success Manager, providing brands with ongoing personalized technical help. You have not to pay any extra charge, it’s already included in the monthly license fee (read through Shopify vs Shopify Plus Comparison Guide to know more). Moreover, due to the fact that Shopify Plus is fully-hosted, security patches and updates are handled for you. If you have lots of backend functionality and want to add it to your platform, then the third-party agency will charge you on an hourly basis, and you’re more likely to be on Magento 2. If this step isn’t your priority or/and money is tighter, opt for Shopify Plus. In turn, Magento 2 offers all customers tech resources, forums, and guides, as well as access to 24/7 phone support (get to know about the difference between Magento Community vs Enterprise). Magento Cloud users can also get assistance from Magento’s account management team, but this comes at an additional cost. For self-hosted Magento clients, most of your support queries will need to go through your hosting provider, which can mess things up. Unlike Shopify Plus charging a fleet fee, the execution Magento timeout depends on your plan price. Commerce Cloud provides two pricing options: Gold (waiting time is up to 4 hours) and Platinum (concerns will be addressed within 2 hours). With a dedicated Success Manager assigned to you at no extra cost and hassle-free workflow, Shopify Plus is hands down the best platform for ongoing support & maintenance. On average, Shopify Plus build projects require less backend development (database work, complicated functionality work, etc. ), and less time for integrations than Magento 2. And though Shopify Plus developers can charge higher hourly rates than Magento 2, the number of hours needed to build the site is significantly reduced. Magento 2 Commerce BAU development cost ranges from $36,000 to $120,000 and $150,000 - $500,000 to start a website. Shopify Plus build projects are priced around $100,000 and BAU development costs between $36,000 and $60,000. Going with Shopify, you shouldn’t care about paying a third-party hosting provider. This SaaS (Software as a service) solution is becoming an increasingly popular alternative for self-hosted website builders, like Magento 2. Today more and more retailers shirk off responsibility regarding PCI compliance, SSL certificates, security patches, and downtime. Therefore, you don’t ever have to wake up in the middle of the night in a cold sweat, worrying about your eStore security. From a development point of view, web-based subscription models leave traditional self-hosted software far behind, since all the system updates are automatic and a retailer won’t waste time and financial resources on manual upgrade. Shopify hosting costs are already included in the license fee, so don’t be afraid of additional charges. Unlike Shopify, Magneto 2 is self-hosted, which means you have two options: hire a third-party company to host your website or host it yourself. Should to be a fun challenge, taking into account that hosting Magento 2 requires a robust server, which can result in astronomical operation charges. So if your eStore runs into tech troubles, you’ll hardly get away with the headache. That’s why most merchants turn to the professional hosting company, that could handle the security updates and performance improvements automatically. This solution provides a user with flexibility and full control but comes with additional expenses. So, you may expect to be billed around $1,000 per month on top. To win back some customers from Shopify Plus, Magento has recently released its fully-hosted version: Magento Commerce Cloud. This PaaS (Platform as a service) is much newer than Shopify Plus, less refined, a lot pricier and hasn’t been widely tested. The cloud version comes in at $3,333 monthly. If you want to have your hands untied and, going with a self-hosted platform, set your heart on Magento. But prefer Shopify plus, if you’re looking for an easy-to-manage site and a smaller monthly bill. Demanding a flat monthly licensing fee of $2000, Shopify Plus worths to be named an all-inclusive solution. With a hosting, unlimited staff accounts, 24/7 phone, and live-chat support, all your expenses will be covered for that price. This cost is capped at $800,000 orders a month, so if your eStore exceeds that order volume, you’ll have to pay a higher rate. For Magento Commerce Cloud, which includes licensing and hosting, your monthly fee is likely to be around the $3500 mark. Magento with third-party hosting is $3000 a month. Magento charges this upfront annually based on ‘gross merchandise value,’ with a minimum of $22k. Think twice when deciding what platform to choose. First, create a realistic financial play and define certainly how much you should invest to hit the jackpot. If you make a mistake, the platform you pick will cause a lot of work and create unmanageable costs. Because it’s quick to deploy and requires less maintenance to keep it running, Shopify Plus ends up being considerably cheaper than both the self-hosted Magento platform and Magento Commerce Cloud. Magento 2 Commerce pricing has been going up. So, if you’re looking to increase your profit margin, Shopify Plus is the way to go. 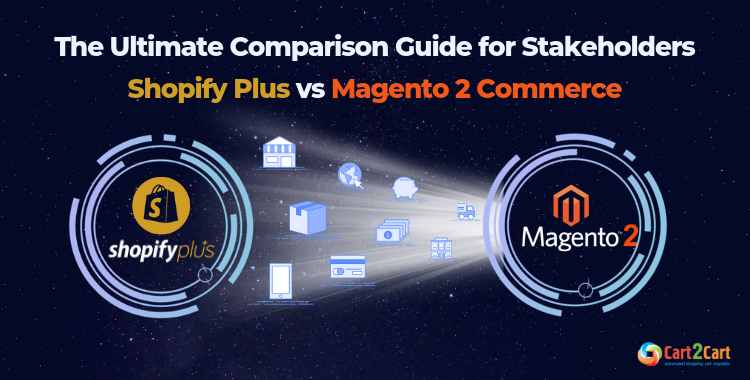 Having compared Shopify Plus vs Magento 2 Commerce, we came to the conclusion, that eCommerce Enterprise Platforms must not only be easy to use and have beautiful themes. They must also have online search support and data analytics features to help websites achieve high ranking in online search and facilitate management and analysis of website data and information. Shopify Plus gives high-growth, high-volume merchants the scalability, reliability, and flexibility they need, without all the hassles, long timelines, and expense of an on-premise solution. Magento 2 Commerce stands out for its enormous range of functions. No matter which platform you prefer, both of them can prove that the best is not the enemy of the good. Try Free Demo Migration, drive grows for your brand!